Ace Futura Story Sam MacLachlan A sportster with a comfy seat, or a tourer with sticky tyres? Aprilia's Futura blends fast with practical for a mile-eater with attitude. It's not often you see a bike with panniers sporting a set of sticky Michelin Pilot Sports. 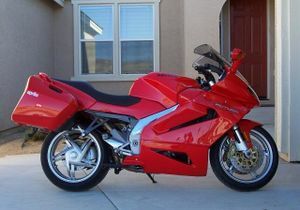 Or mixing a single-sided swingarm with quality pillion accommodation. The Futura does, and the result? A bike that can transport the rider large distances in comfort, yet still get up and boogie when the situation allows (demands?) it. These features were perfectly suited to a recent mission of mine, which involved riding to Tumut (NSW) from my Melbourne home base to meet up with my Sydney-domiciled girlfriend, Bec - the hastily-arranged solution to an air travel (or lack of) problem! Starting out from Melbourne around 5.00pm on a Friday meant battling traffic to the city outskirts, then a leisurely drone up the Fume Freeway and Snowy Mountains Highway in order to make Tumut at something resembling a decent hour. 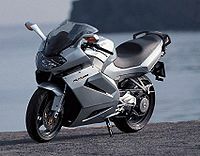 The Aprilia Futura was first unveiled late last year, prior to its worldwide launch in early 2001. It's the result of Aprilia's desire to become a major player in the world's motorcycle marketplace, and therefore compete in a number of market sectors. 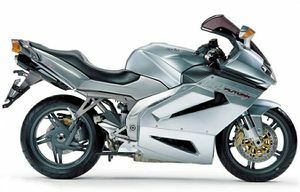 While the $19,990 Futura - or RST1000 - has a modified version of Aprilia's established 60-degree, liquid-cooled V-twin, it's wrapped in its own twin-spar aluminium chassis. The chassis is one reason the fully-loaded Futura was impressive through Melbourne's tin-top maze as I made my escape from Horror HQ. The rake and trail figures (26 degrees and 102mm) were conceived with easy low-speed handling in mind, and have succeeded admirably. Numerous full-lock U-turns for the photoshoot also proved the point, the RST displaying manoeuvring agility an out-and-out sportster doesn't have a hope of matching. Once clear of the Melbourne traffic and on the Hume, with the on-board temperature display reading a fresh 11 degrees, the Aprilia's mile-eating nature began to shine through. The large screen, whilst non-adjustable, did an excellent job of confining the breeze to level with my shoulders and above - leaving my helmet in clean air with little buffeting or excessive noise. 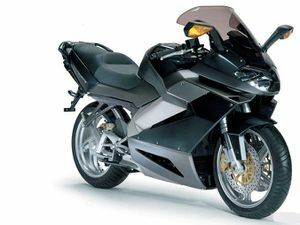 One interesting omission from such a bike is rubber-topped footpegs - for either the rider or pillion. While the vibes through the pegs aren't numbing, the bike would definitely be more comfortable with them. I gave the seat little thought, a sure sign it's comfortable, my pillion later confirming that the rear accommodation is equally as comfortable. In fact the seat was still comfortable right up until my first fuel stop 245km later, the bike returning a handy 15.6km/lt. The tallish gearing no doubt helps here, with 100km/h equating to just 4000rpm in sixth (top). This equates to a touring range of around 280km in highway mode before the fuel light blinks on, signalling five Litres left in the 21-litre tank. The pie-style LCD fuel gauge proved accurate, also. Whilst I will never mark riding the Hume as one of my favourite stretches of tarmac, the Futura went a long way towards making it bearable - partly because it was so comfortable, partly because I could get it over and bloody done with in short order thanks to the impressive fuel range and comfort! As comfy as it is on the highway, turning on to the Snowy Mountains Highway was a relief, despite the plummeting temperature (down to nine degrees by now). With the impressive high beam lighting the deserted highway ahead, I could really get down to enjoying myself, the stability through long sweepers feeling secure enough, whilst line changes mid-corner (dodging potholes and gravel patches) only required a light touch on the bars. A tendency for bikes with loaded panniers to wallow is overcome on the Futura with the easily adjustable rear preload on the Sachs shock, allowing the rider to quickly adjust the spring according to load. Winding the remote knob up to two clicks short of maximum improved the steering as well, as it effectively raises the rear ride-height. The trade-off, of course, is a firmer rear end - not of the tooth-rattling kind however. The rebound damping is also adjustable. The USD front forks are well-controlled, with just preload and rebound adjustment available, even though the compression adjustment furniture is still there in blanked off form. Compression adjustment isn't missed on this bike however, with the standard suspension settings doing a great job of keeping the front tyre in contact with the road in most usage. In fact the suspension is excellent in the real world it was designed for, the odd pothole I did manage to nail prompting nothing but a thump from the Michelin Pilot Sports, all the while the bike ploughing on as though nothing had happened. The brakes were disappointing though, especially compared to the same marque's RSV Mille which employs Brembo Goldline calipers. The Futura's brake rotors are downsized from the Mille (300mm from 320mm), which goes part way to explaining the difference in performance, though I reckon it's probably more than that - pad material for instance. 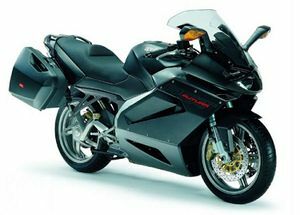 While the brakes did the job, they are being stretched by the time a pillion and luggage are aboard, requiring a firm squeeze of the adjustable lever before they start offering much power, while feel at the lever was relatively lacking. Arriving at Tumut five and a half hours after leaving Melbourne, I still felt good and the bike hadn't missed a beat. I was looking forward to heading home the long way! Oiling the chain on arrival was made easy thanks to the easy-to-use RST centrestand, although it does scrape at times while cornering, which probably explains the lack of hero knobs on the rider's pegs. The next day Bec and I headed off to take a look at the Yarrangobilly Caves, around 85km further down the Snowy Mountains Highway. Once into the twisties and heading up the mountain, I tried in vain to cause the Sagem fuel injection to play up. Rolling open the throttle from closed just saw forward motion resume with no missing, coughing or hesitation. The engine, whilst claiming less power than its RSV brother at 113ps at 9250rpm, still powered us up the mountain in style, all the while emitting a quiet but satisfying growl. 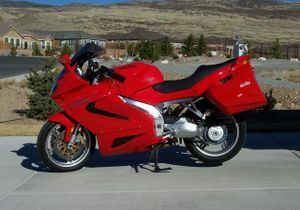 I found bouncing the needle off the 9500rpm redline proves unnecessary with this powerplant. Smoother, more enjoyable drive comes from short-shifting just above maximum torque (9.78kg-m at 7250rpm) at around 8000rpm, it certainly makes it easier for the pillion hanging on to the excellent grab rails. The gearbox on our testbike got better as it warmed up, but was a little notchy when cold. Shifting gears was still easy, and the hydraulically-operated clutch (with adjustable lever of course) was nice to use. I was enjoying myself so much, I was a little surprised to feel a tap on the leg from Bec, before she asked me to pull over. "What's up?" I asked. "It's snowing," she pointed out in a tone that suggested continuing would be bad for my health, one way or another. Message understood, we turned around and gingerly made our way back to safer altitudes. I wasn't game to check the temperature at that stage! 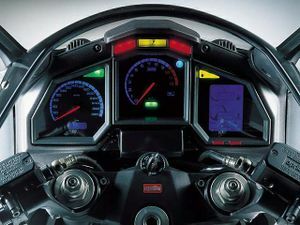 The dash is well laid out, utilising an easy-to-read clock-style speedo in place of the RSV and RS250's LCD displays, and glows a funky blue in low light. There are also comprehensive idiot lights, as well as LCD engine temperature and fuel gauges, and a single trip meter, all accurate and handy for the long haul. A keyhole on the left of the dash intrigued me though - what the hell was it for? Turning it didn't seem to do anything at first. It turned out to be the seat release, which allows the entire seat unit to be lifted, rear side panels and all! 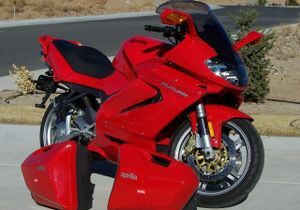 There isn't room underneath for anything much larger than the adequate Aprilia tool kit. That's what the optional panniers ($1,209) are for I guess. The panniers are a decent size too, the under-seat exhaust meaning the panniers are of equal size due to not needing to make room for a muffler. I reckon the muffler looks good from behind, and in fact liked the styling in general, although the looks received a mixed reaction from various people. The mirrors, too, are part of the whole styling exercise, incorporating the indicators in the mirror body. 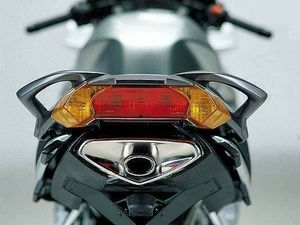 The left mirror on the test bike vibrated excessively, making the view a blur, while the right mirror performed adequately, though a little small. The finish all round is very good, as to be expected from Aprilia, with the panniers remaining watertight even through a thorough downpour for instance, and the single-sided swingarm a well executed touch of class. 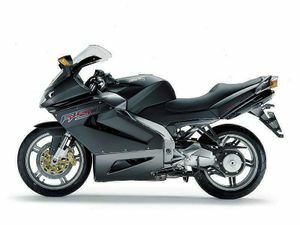 More and more, the line between sportsbikes and sportstourers is becoming blurred, with bikes built for comfort able to provide genuine real world sportsbike performance - the Futura is one of these. 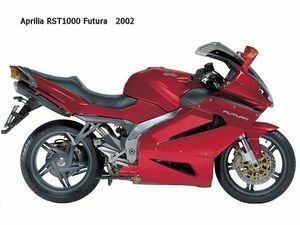 Against the RST in the marketplace are Ducati's 916-engined ST4 at $18,995 and 996-engined ST4S at $20,995, BMW's R1100 S at $17,820 and R1150 RS at $19,900, and Aprilia's own Falco at $18,975. 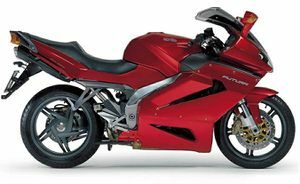 Throw in Honda's VFR800 (current 2001 model) at $15,690 and Triumph's Sprint ST at $15,490 and there's plenty to choose from. The $19,990 RST1000 represents another step forward for Aprilia, and is well and truly up with the established competition in the company's first attempt - an admirable achievement and one I enjoyed sampling. This page was last edited on 1 February 2011, at 18:15.